Sea Salt Cremini Truffles for sale. Buy online at Zingerman's Mail Order. Gourmet Gifts. Food Gifts. Cremini, that's a mushroom, right? Usually yes, but not in this case. In the Piedmont region of northern Italy, a "cremino" (plural cremini) is an ultra-smooth cube of chocolate and hazelnut gianduja. You'll find them in the cases of every fancy chocolate shop. 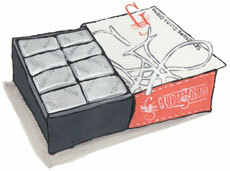 These cremini come from Guido Gobino, a bean to bar chocolatier in Torino, Italy, the heart of gianduja country. They source their cacao beans directly from small farms around the world, and then they choose each chocolate carefully for each confection they craft. The cremini are super silky smooth, dotted with a few toasty hazelnut crumbles. The rich sweetness of the chocolate gets just a bit of an edge from the addition of sea salt. Getting a box of 16 of these individually-wrapped morsels feels like winning the chocolate lottery.